Many publishers swarmed in on THQ's trove of established licenses earlier this year, but Nordic Games arguably got one of the biggest takes by buying both the Darksiders and Red Faction franchises. However, it'll probably be a while before we see anything new from those franchises, considering Nordic bought the licenses just this April. So what do you do with a stack of licenses and nothing new to show? Put them on sale. 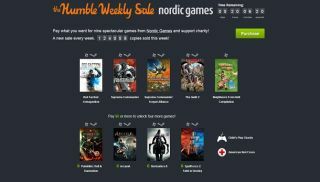 Nordic Games has taken over this week's Humble Weekly Sale , and you'll notice it's plastered with games that used fall under THQ name. Paying a penny or more will get you Red Faction: Armageddon, The Guild 2, Neighbours From Hell Compilation, the original Supreme Commander its standalone expansion, Forged Alliance. Paying at least six of your hard-earned dollars adds Painkiller: Hell & Damnation, ArcaniA, Darksiders 2 , and SpellForce 2: Faith in Destiny to the list. I'm not sure why Supreme Commander 2 and the original Darksiders aren't bundled, but you can't really complain with six dollars. Well, you can , but not without sounding the opposite of humble. Every game comes with a Steam key except the Neighbours From Hell Compilation, though that's because the game's still trying to be greenlit on Steam. The game listing says users will automatically receive Steam keys if the game gets the greenlight. It's not really a big deal considering you have eight other games to play, though I suppose you could just double-click the .exe like a caveman. Correction: This article previously referred to the sale as a "Humble Bundle," which is distinct from the "Humble Weekly Sale."